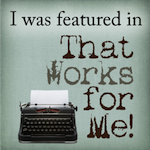 OK - you wanted to know who won my Giveaway...it is Sarah Mae at Like a Warm Cup of Coffee. Congratulations, Sarah! 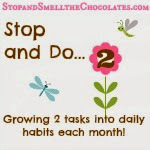 I love her blog - she has started a good series on wisdom and has some great lifestyle challenges (I confess, I haven't done very well at them). And, honestly, sometimes I just click over to gaze at the warm & cozy header photo. 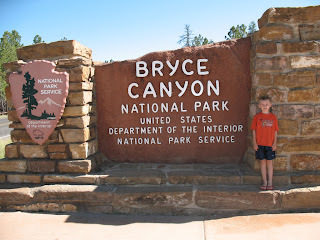 Here we are at Bryce Canyon - a bit of driving to get there. It's kind of in the middle of nowhere, but pretty country. Here's a look at a large part of the park from the rim. Such interesting scenery! This is one of the best spots to see in the park - isn't it fascinating? 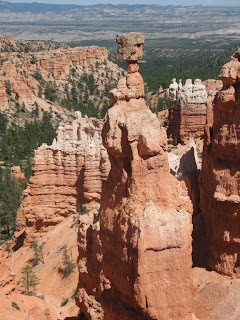 The things sticking up out of the ground (formed by erosion) are called hoodoos - really! This tall formation is called Thor's Hammer. 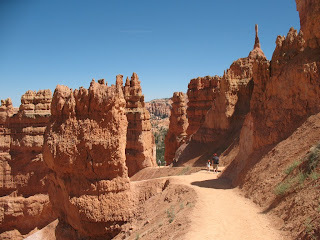 This is one of the trails you can walk on down into the canyon. I think this pic looks like a different planet! I had walked down the first very steep leg of this path, then realized that if I continued - I might not make it back to the top! My husband and son continued further down before coming back. It was so hot that you didn't dare go too far if you didn't have at least a couple of bottles of water with you. Same path, but looking upward from the path (taken by hubby). I love the hot sun blazing in the photo. I know it was quick, but hope you found it interesting to look at. 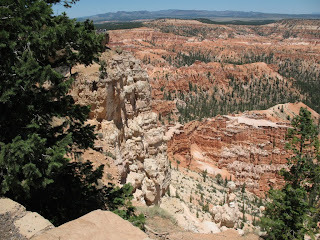 If you ever go through any National Parks in Utah, it is worth taking the time to see Bryce Canyon. We're really glad we did. Do you have any exciting trips coming up this summer? Wow! That is beautiful! The only thing I have going on this summmer is a trip to N.C. to visit my sister and my hubby and I's five year anniversary - we might to D.C. or Baltimore and peruse museums and such. Incredible! We've never seen it all...there's always something new and amazing at the next place we visit. That's what I enjoy about travelling! 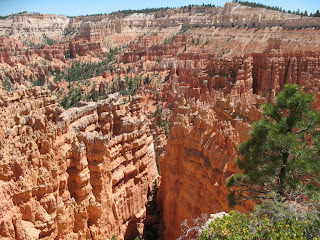 Thanks for sharing Bryce Canyon...one more place I'd like to visit one day. Man that is just awesome. I want to travel now that we have retired and I WILL DO IT...someday. So many places to go and see. God has sure made some beautiful scenery huh? I will add this to my list, thanks for sharing. Terrific pics Lisa. 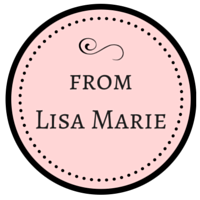 I am finally taking time late tonight to 'travel' a bit on everyone's post....thanks for the trip! That is one place I would love to visit. I have seen so many lovely pictures of the area. Thanks for posting about your great trip. God is the ultimate artist. Simply breathtaking! This summer, we are headed to Laguna Beach, my home town. Can't wait! The variety of landscape on this earth never ceases to take my breath away. 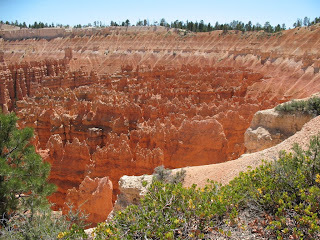 Thanks for sharing your exquisite photos of Bryce Canyon. Unbelievable rock formations and colors! What a beautiful place to see, Lisa! 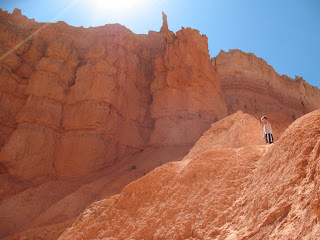 Those "hoodoos" remind me a little of the Giant's Causeway in Ireland that I wrote about on my blog. Nature makes amazing things. It does look like a different planet in that photo. I'll put that on my list of things to see if I ever make it past the Tennessee border! LOL! Big maybe I'll go in the winter when it's not so hot and actually be able to hike to the bottom and back up without dying size hugs to you!